On September 12, we have a workshop Bauen von geometrischen Körpern with Paul Hildebrandt, founder and inventor of Zometools. Especially for school pupils and teachers. Best Paper Award (1st Prize) with Klaus Hildebrandt for the paper. 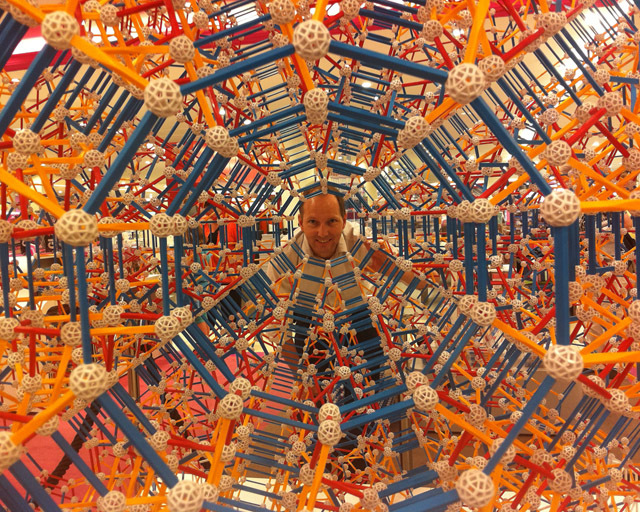 Largest Zometool ever built in Germany: Biggie (omni-truncated 600-cell) shown at KaDeWe in July. On August 1, the Biggie was moved to our institute and found its home. English translation ready to print middle of August. French and Italian versions in translation. Exhibition "Symmetriy - Playing with Mirrors" attracted more than 6000 school pupils at the institute of mathematics in early 2011. I am MATHEON-Professor and head of the Mathematical Geometry Processing group at the Institute of Mathematics at FU Berlin. I am full professor of Mathematics with research interests in the areas mathematical geometry processing, discrete differential geometry and mathematical visualization. As chair of the Berlin Mathematical Society, one of my side-activities is the public mathematics plattform math.berlin. Further links: Mathematical Geometry Processing - Institute of Mathematics - FU Berlin - Matheon - Berlin Mathematical School - Berliner Mathematische Gesellschaft / Berlin Mathematical Society. 3D geometry and visualization software for research, education and industrial applications, new major version 5.0 ahead. Mathematics platform and shop vismath.de offers mathematics related products. Need math films for a school event? Plus Magazine "The best science site on the web" is winner of the webby award. Watch out the column Imaging Maths. Some time ago the bubble man Tom Noddy was guest of my course "Visualization and Mathematics"